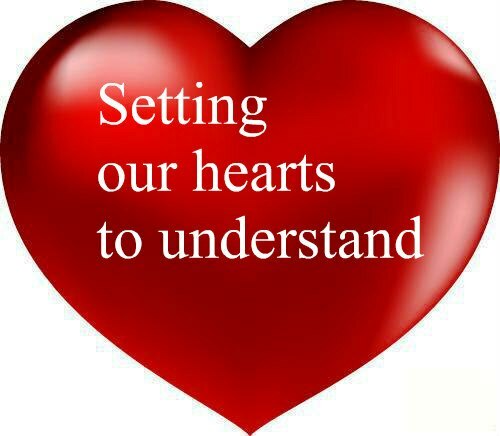 Setting our heart’s to understand – I Am Not Ashamed Of The Gospel Of Christ! There is more than one place in scripture where we learn when a persons heart is converted unto the Lord it understands His ways and is healed! (Acts 28:25-27), 25 And when they agreed not among themselves, they departed, after that Paul had spoken one word, Well spake the Holy Ghost by Esaias the prophet unto our fathers,26 Saying, Go unto this people, and say, Hearing ye shall hear, and shall not understand; and seeing ye shall see, and not perceive:27 For the heart of this people is waxed gross, and their ears are dull of hearing, and their eyes have they closed; lest they should see with their eyes, and hear with their ears, and understand with their heart, and should be converted, and I should heal them. (Isaiah 6:8-10). Daniel had a vision of the Lord speaking to him,a vision he alone saw as with a quaking others fled to hide themselves.It was a vision of what was to befall the people in the latter days.He was told the most beautiful words that his words were heard by the Lord the first day he had had set his heart to understand and chasten hinself before God! (Daniel 10:5-14). 5 Then I lifted up mine eyes, and looked, and behold a certain man clothed in linen, whose loins were girded with fine gold of Uphaz:6 His body also was like the beryl, and his face as the appearance of lightning, and his eyes as lamps of fire, and his arms and his feet like in colour to polished brass, and the voice of his words like the voice of a multitude.7 And I Daniel alone saw the vision: for the men that were with me saw not the vision; but a great quaking fell upon them, so that they fled to hide themselves.8 Therefore I was left alone, and saw this great vision, and there remained no strength in me: for my comeliness was turned in me into corruption, and I retained no strength.9 Yet heard I the voice of his words: and when I heard the voice of his words, then was I in a deep sleep on my face, and my face toward the ground.10 And, behold, an hand touched me, which set me upon my knees and upon the palms of my hands.11 And he said unto me, O Daniel, a man greatly beloved, understand the words that I speak unto thee, and stand upright: for unto thee am I now sent. And when he had spoken this word unto me, I stood trembling.12 Then said he unto me, Fear not, Daniel: for from the first day that thou didst set thine heart to understand, and to chasten thyself before thy God, thy words were heard, and I am come for thy words.13 But the prince of the kingdom of Persia withstood me one and twenty days: but, lo, Michael, one of the chief princes, came to help me; and I remained there with the kings of Persia.14 Now I am come to make thee understand what shall befall thy people in the latter days: for yet the vision is for many days.